There is something magical and fascinating about indifference. Sometimes, you notice an incredible detachment of people in front of the most improbable situations; some other times, it is you taking the distances from events that involve many of those around you. That’s so unbelievable and unexpected that leaves you incredulous! In these situations, the image of a happy green frog sipping a cup of English tea is the best portrait of the serene, imperturbable aloofness that we want to describe. He is so calm that you doubt about his awareness. And the funniest part is to think the he is actually well aware of everything that is going on; it’s just none of his business! As you well know, Kermit is not just any naive frog. He is a real star, protagonist of movies and shows, included the popular Sesame Street and The Muppet Show. Craziness and oddity are the main traits of its character and are perfect to create a very peculiar meme. Use the image of Kermit The Frog Drinking Tea to express that feeling of carelessness which is amazing to feel and astonishing when noticed in others! 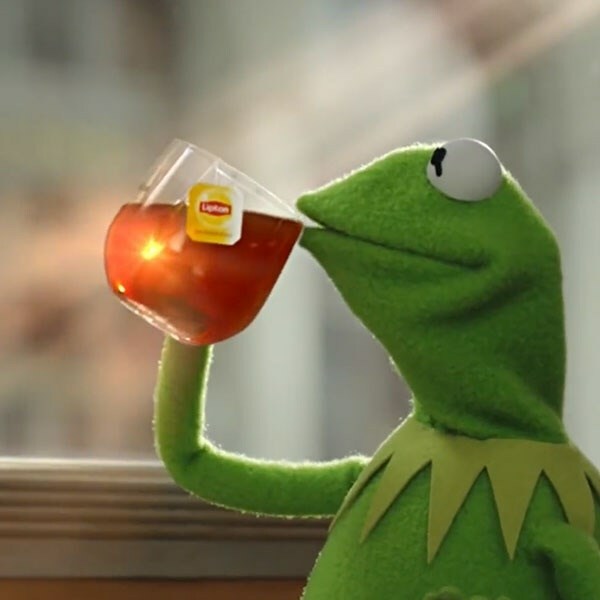 Generate your Kermit The Frog Drinking Tea Meme You can create your “Kermit The Frog Drinking Tea Meme” without losing your aplomb. Just click on the button “create a meme” and write a caption that expresses your thoughts. You will be able to write a sentence at the top and one at the bottom of the image. We advise you not to write too long sentences, so that the image remains prominent and the characters do not get too small. Start now and create this and many other royalty free memes at memegenerator.net!